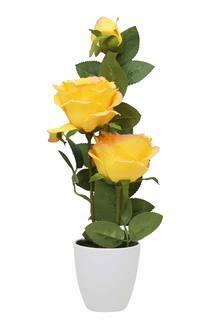 With this beautiful artificial potted plant, give your home decor a nice upliftment. Place it in the centre of your dining table or in the corner of your room and amaze the visitors with the allure of Rose flower within the premises of your living space. Decorate your home with this artificial potted plant from the house of Ivy that comes with the resemblance with the rose flower.